Cleveland, via I-77, is approximately 15 miles north, or about 25 minutes driving time. Akron, via Route 8, is approximately 12 miles south, or about 25 minutes driving time. Cleveland Hopkins Airport, via I-480, is approximately 23 miles west, or about 30 minutes driving time. 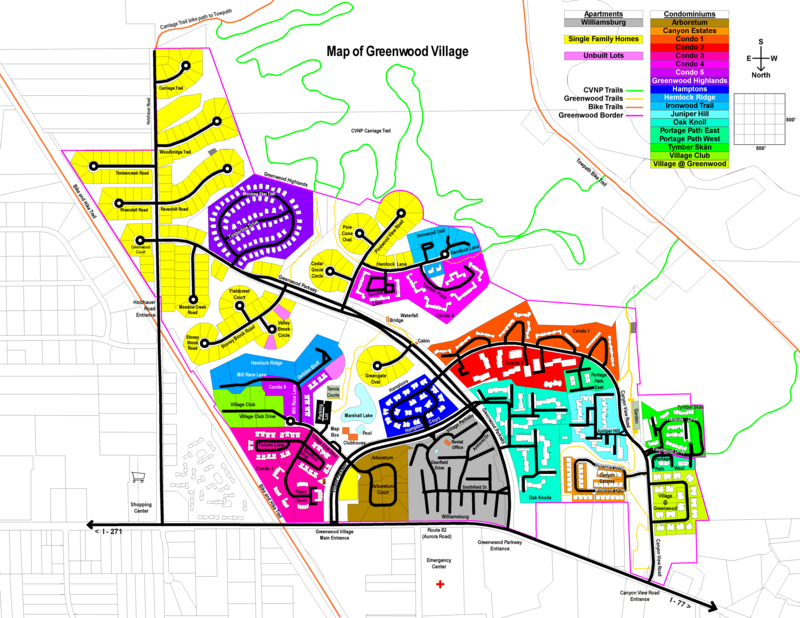 This map is oriented to match the way you are facing as you enter Greenwood Village, which means North is down and South is up, the reverse of most maps. To find a home in Greenwood using this map, first look up the street address below to find what Association it is in, then look at the COLOR KEY on the map to find the color for that Association. Look for that color on the map, your street is located there. The white properties are Greenwood’s Common Open Areas, set aside for all residents to hike and enjoy. This map and the GVCA Newsletter, which includes a list of Homes For Sale, are available from the boxes on the traffic island in front of the Clubhouse. A new window will open with the map. Move cursor over map – the cursor will become a magnifying glass with a plus (+) sign in it. The + sign in the magnifying glass will change to a minus (-) sign. Click again to reduce the map size.